What was once a very scary and confusing place is now a familiar and comforting place for me and my family. “I know this place like the back of my hand,” my 15-year-old daughter Andi said after telling me where the closest water fountain was at Cincinnati Children’s Hospital Medical Center main campus. I giggled and reflected on the last three years. Three years ago, we could barely find the ER when needed to or the neurology department on A8, which we had just been introduced to a few years earlier. We would often find ourselves lost in the building if we had to park in a different part of the garage or use a different entrance. But not any more. 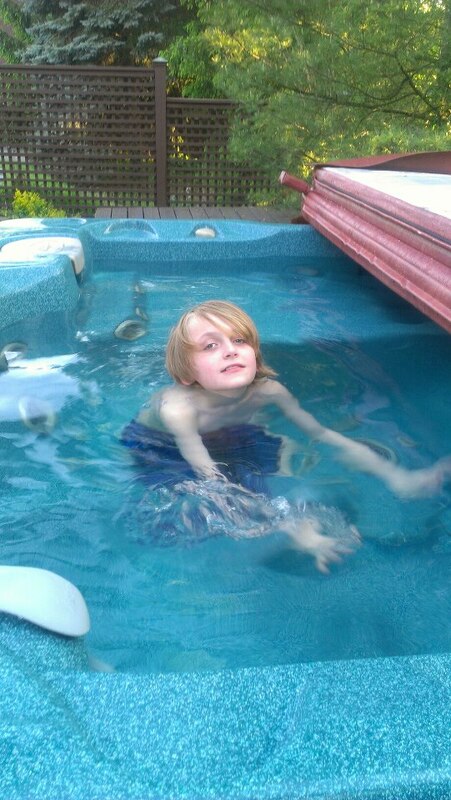 Almost three years ago, my son Joey who is now 13, was diagnosed with Langerhans Cell Histiocytosis, a rare disease that doctors argue over whether or not it’s cancer. His white blood cells ate his hip bone causing him to need a bone graft, months in a wheel chair, steroid treatment, months with a walker and then crutches and years of physical therapy (read stories posted HERE for information about LCH and Joey’s battle). In those three years we have gone from barely being able to find the ER when needed and neurology for Andi’s migraines to knowing where the cool art is in the building, where to find a water fountain, the best items on the lunch menu, where oncology, orthopedics, physical therapy, blood draw, radiology, the emergency room, behavioral medicine, a quiet outside area and so much more are located. We can give directions to those new to the hospital. We are no longer shocked by some of the things we see like children with missing limbs, those in body casts or little ones with burned bodies. We are still saddened but no longer shocked. We now have favorite nurses in several departments. We know staff members by name, and they know us. We know which techs are better at drawing blood and giving shots. We know which clinics have the best coffee and hot chocolate. We even know most of the valets by name because when you have a kid in a wheelchair or pain, you let someone else park the car. We know how to get massages for the patient and mom, how to get discounted meals and where to get a breath of fresh air without worrying about the neighboring community. We know what days we can find Circus Mojo performing and in which clinics. Cincinnati Children’s Hospital is so big and complex that it used to be a scary place to my family. Now oddly enough, we find comfort being there. We seek out our favorite art piece, a framed quilt (read about it), when we need a good distraction. We go outside near Alvin and the Chipmunks when we need fresh air. We bring our favorite nurses cookies from time to time and stop by to see our favorite doctors or staff members just to say hi between appointments. I think the reason it brings so much comfort is because before Joey was diagnosed and in pain, we were lost and frustrated. We needed answers and it was Dr. Neil Johnson at Cincinnati Children’s who gave us those answers and put Joey on the road to recovery. Dr. Johnson is a hero in our eyes, along with all the other doctors, nurses and staff who helped us along the way. The doctors at Children’s have also helped Andi with her migraines. Everyone there is so kind and reassuring. We’ve learned things aren’t always as scary as they seem and sometimes the places that seem the scariest might just be where you can get the most comfort. 7:10 p.m. finally comes. I walk Joey, my 12-year-old son, to the meeting spot. The U.S. Bank Arena employee hands me a waiver. I sign. He then leads us through the stadium and down toward the ice rink. As we walk down the steps some good friends see us. “JOEY!” they scream. 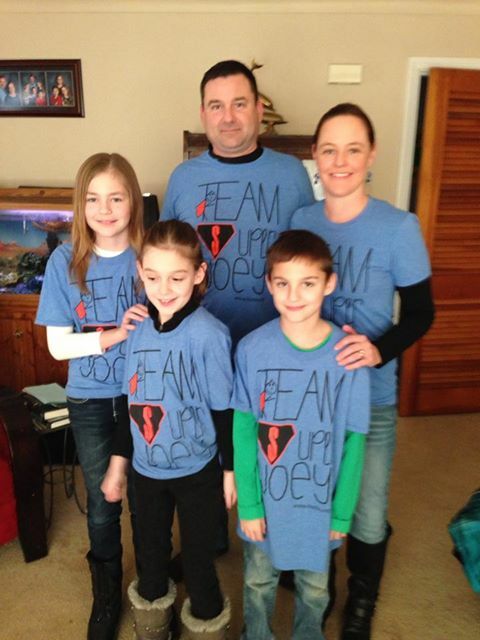 They are all wearing Team Super Joey T-shirts. This makes him even more excited. We get to the penalty box where the employee places a helmet on Joey and explains the process. First a beautiful girl with an amazing voice goes out on the ice to sing the National Anthem. Now it’s Joey’s turn. With thousands of people watching, he heads out on the ice, remembering what all of his friends have said “don’t slip on the ice!” He gets to the center where the Cincinnati Cyclones mascot hands Joey the puck. The center from each team is there ready to go. 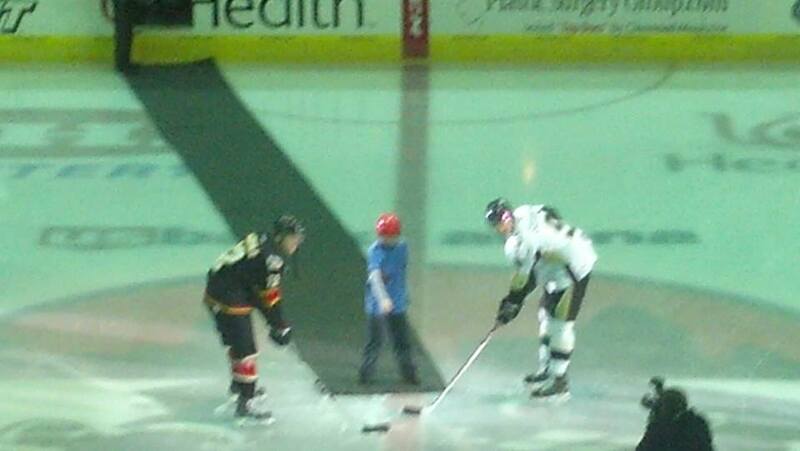 Joey drops the ceremonial puck, shakes hands with the players, grabs the puck and heads off the ice. Every day, the experts at Cincinnati Children’s Hospital change the outcome for children and their families. 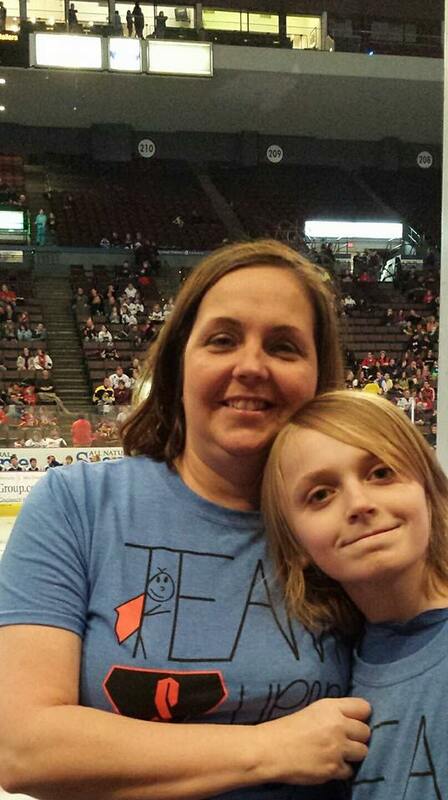 One of those families is here tonight to share their story with Cyclones’ fans. Joey Holt was diagnosed with Langerhans Cell Histiocytocis, a cancer-like disease that causes the white blood cells to attacks bones or other organs, at 10 years old, which led to the disintegration of his hip bone. Joey underwent a bone graft, four months in a wheelchair and a year and a half in physical therapy and still deals with chronic pain periodically, but thanks to Cincinnati Children’s hospital, he can walk, run and do many other “kid” things. Today, Joey is a happy 12-year old who attends Highlands Middle School, is a member of the school chess club, and “Odyssey of the Minds” team. Joey hopes his love of science leads him to find a cure for Histio someday. 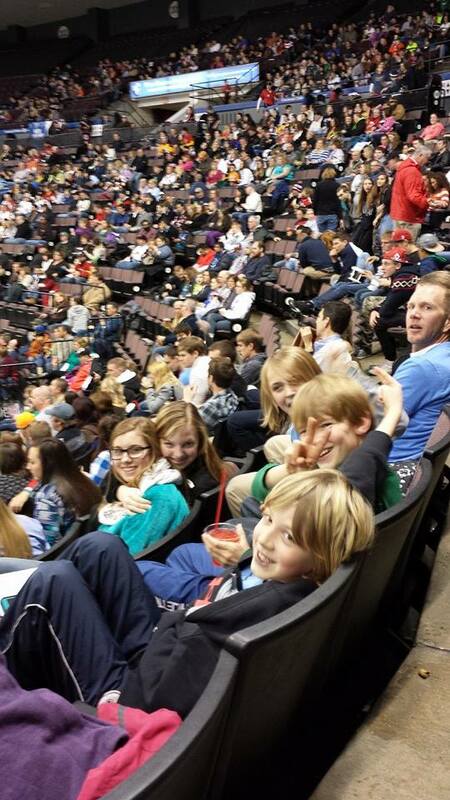 Joey’s family are big hockey fans, but this is Joey’s first game! As we walk back up the steps people reached out to give joey five as they continued cheering him on. He was smiling ear to ear and beaming with excitement. We had a great time watching the game. At least 40 members of Team Super Joey were in the crowd. Several, including Joey, ended up on the jumbotron dancing with their blue Team Super Joey shirts on. 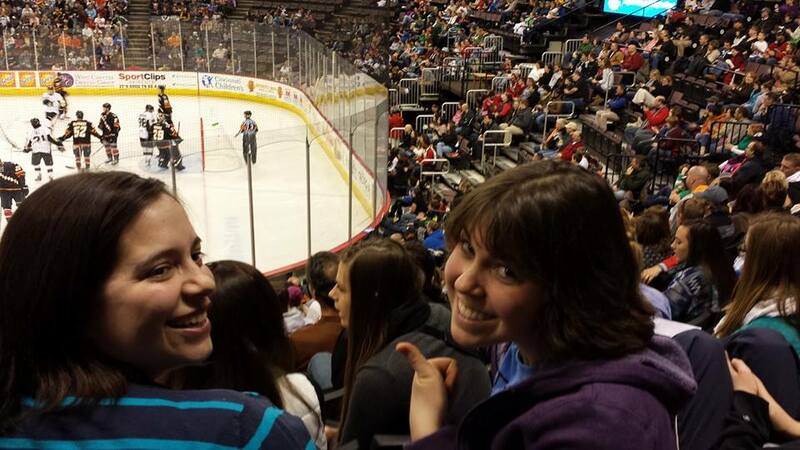 The entire night was a lot of fun ending with a Cyclones win and indoor fireworks. I don’t think Joey quit smiling the entire time we were there. His sister Andi and all of our friends had a great time too. This evening was made possible through Cincinnati Children’s Hospital Champions program. They asked Joey to participate and provided our family’s tickets. It was all pretty awesome. I hope my 11-year-old son Joey has a broken leg! Or maybe a chipped shin bone! Wait, maybe he has torn his meniscus! That would be AWESOME! IT WOULD SERIOUSLY BE THE BEST NEWS A MOM COULD WISH FOR! I’m not crazy or one of those moms who wishes illness upon her child. I actually love my son to the moon and back and would be willing to take on any pain for him. Unfortunately, I can’t do that. Joey is no stranger to pain. He had ear infections, strep throat and many minor surgeries since he was only a few weeks old. 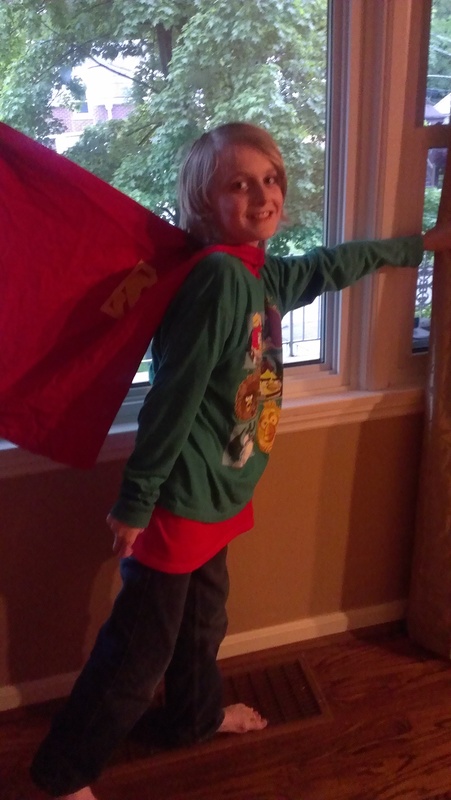 In April of 2012, Joey was diagnosed with Langerhans Cell Histiocytosis causing him to have a lesion removed and a bone graft of his hip (Read about diagnosis). Well, for about the last two weeks he’s been complaining of knee and shin pain. It’s progressively gotten worse. So bad in fact that he is using crutches and missed the last two days of school. LCH or Histio, is a cancer-like disease. It causes his white blood cells to go nuts. They think he’s sick so they go into action. Only there is nothing bad to attack so they end up eating his bones away. So my son is having severe pain. My immediate thought is ‘oh crap, his white blood cells are out it again. The Histio is back.’ My second thought is ‘Oh God, please let my son have a broken leg, a chipped bone or a torn meniscus.’ I find myself pleading with God to give him one of these ailments instead. You see, if it is Histio, it won’t “JUST” be surgery, a bone graft, 15 weeks of a wheelchair, months on end of physical therapy, etc… It could be all or some of those things but it will also be chemotherapy. Chemotherapy: the use of chemical agents to treat diseases. That scares me to death! I’ve never had chemo and I’ve never discussed it with someone who has. All I know is what I’ve seen on TV. When I hear of chemo I think of extremely thin, sickly looking people with tons of tubes, loosing their hair and vomiting. Now my friend Aimee assures me this isn’t what it’s really like but it scares me to death. One step at a time though, right? So the first step was to see our oncologist, which we did today. The second step was to get x-rays. We did that and are waiting on results. Unfortunately x-rays probably won’t show Histio but they will show a broken bone!!!! Wohoo for a possible broken bone! The next step is an MRI. I am waiting to hear when that has been scheduled for. That will show us if it’s Histio. If nothing shows up there, we move on to a PET Scan. So I am asking this of my readers tonight as crazy as it may sound. I know something is wrong. My son is in SEVERE pain. So this is what I ask of you. Pray and hope for a broken bone, a chipped bone or a torn meniscus. Pray and hope for something other than Histio because Histio is one bad mother… and because I’m afraid of chemo. Seriously, if you pray, please pray a lot for my son to be well and strong and for our family as well. And if you don’t pray, send us some good vibes and positive thoughts! Joey and his 14-year-old sister love to read your encouraging comments so comment away! 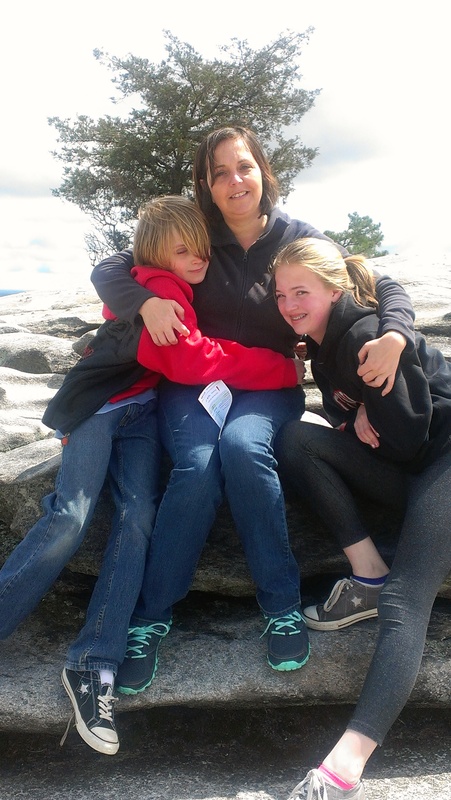 My 11-year-old son Joey suffers from Langerhans Cell Histiocytosis. His white blood cells attacked his hip bone and ate it away causing him to need a hip bone graft and spend several months in a wheel chair. He’s been in and out of the hospital for the last 16 months. This disease could attack again at any time. There is no cure. There is very little funding for researching. 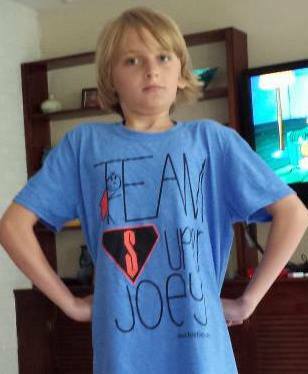 You can help us find a cure for Joey and the thousands of other kids this disease affects. My son is training for Histio Hike Ohio that takes place at the end of September. He plans to do the six mile hike. He must get his leg and hip stronger to be able to participate without pain. He walks, rides his bike and does his physical therapy exercises everyday. He is looking forward to meeting other kids with Histio and being able to talk to them about what he is living with and what he’s been through. This hike has given him something to look forward to and an incentive to work hard and get stronger. 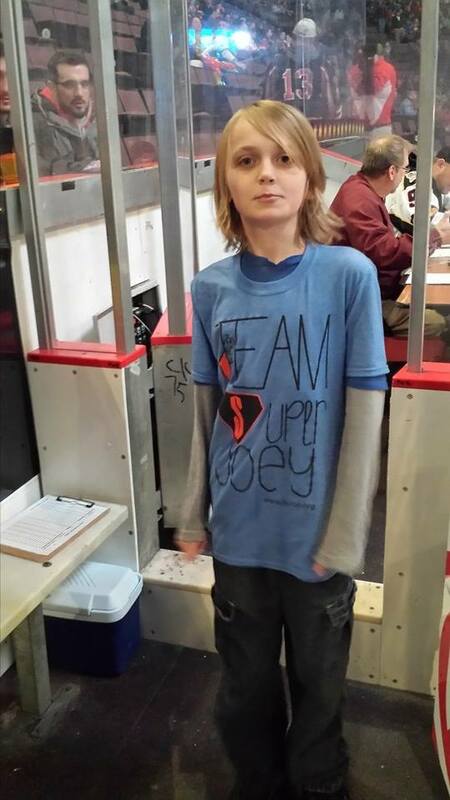 There are two ways you can show Joey your support and help find a cure for his disease. 1. You can sponsor him in the hike by going to this site. We truly appreciate your donation whether it’s $5 or $500. 2. You can buy a Team Super Joey T-shirt (art below). Shirts cost $15. They come in men’s and youth sizes and should not shrink. They are super soft light-weight Ts. Joey’s 14-year-old sister designed the shirts. You can email me your T-shirt order (gina5620@gmail.com) or put it in a comment on this post. If you know me personally, you can give me the money or anyone can pay via paypal by entering my email address. We will ship T-shirts to those out of the Greater Cincinnati area at no extra charge. Proceeds will be given to Histio research. It would be amazing for Joey to see people in the community, family and friends sporting these T-shirts in support of him. Please help us find a cure for Joey and all the other kids who suffer from this rare disease (or rarely detected) by making a donation and/or buying a T-shirt. We truly appreciate your support! Please leave a note here in encouraging Joey in his training for the hike. He loves reading your words of encouragement. Please follow Raising2tweens on Facebook. My 11-year-old son said those words to me. It broke my heart. I promised him I would do everything possible to make him pain-free again. He went to school on Monday but the pains became so severe it was taking his breath away. We headed to massage therapy at Lifestyle Resumption. The massage helped but within an hour the pains were back again. He couldn’t go to school Tuesday. I took him to Tiny Needle acupuncture where she did something called the Seven Dragon (needles in back and head). This helped a lot but once again the pains sneaked back up. Thanks to a good friend, we did some hot tub therapy. This also helped but again the pains were back soon after. The Pain Team at Cincinnati Children’s Hospital has been working with us. They changed his meds up on Tuesday and I hope it helps. I’m going to ask his physical therapist about water therapy at Children’s. This is getting to be a lot for an 11-year-old to handle so he will start seeing a counselor at Children’s later this month. It’s hard for me to handle so I can’t imagine what he’s going through. Please keep posting positive messages here. Joey loves to read them! P.S. If you are not following Raising2tweens on Facebook, you should!